It's time for the annual PEPÁḴEṈ HÁUTW̱ (blossoming place) event! Join the UVic CMC, students and other community members at the ȽÁU, WELṈEW̱ Tribal School grounds in Brentwood Bay next Friday, June 15 from 9am - 1pm for a morning of of eating, tasting, and edible plant learning! Did we mention the face painting? We are also now a non profit society! The PEPÁḴEṈ HÁUTW̱ Food Systems Education Foundation is now a certified BC Society and we are currently awaiting charitable status. 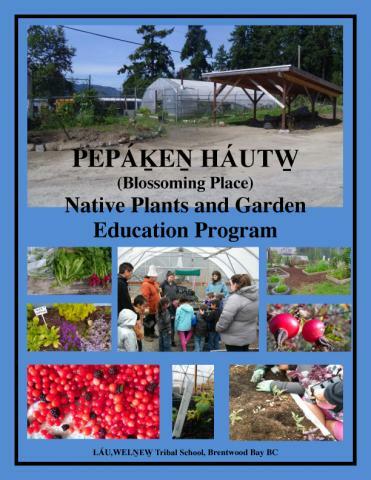 EPÁḴEṈ HÁUTW̱ (Blossoming Place) is a native plant nursery, community school garden, restoration project, and the home of the PEPÁḴEṈ HÁUTW̱ Native Plants and Garden Education Program. Located at the ȽAU,WELṈEW̱ Tribal School(link is external),(link is external) this special place has been transformed from an underused area in the back lot of the school into a beautiful blooming oasis. Students of all ages come to enjoy planting vegetable gardens, propagating native plants and participating in the restoration and development of the native plant gardens in front of the greenhouse space. The Blossoming Place initiative is continually evolving to be a better resource for native plant and garden education in the W̱SÁNEĆ community and beyond, fostering healthy and traditional food skills in youth and making meaningful steps towards food security and indigenous food sovereignty in the community. The UVic Geography Community Mapping Collaboratory has supported PEPÁḴEṈ HÁUTW̱ for a few years now and the wonderful Judith Lyn Arney has been a tremendous support to Geography! Attendees and guides include Elder and plant knowledge expert Earl Claxton Jr, the Lifecycles Growing Schools Program , representatives from the Capital Regional District, Fiona Devereaux of the Vancouver Island Health Authority Aboriginal Health Program, and other fantastic volunteers! Approximately 300 k-12 students and adult learners will cycle through the activities by class every 30 minutes. Check out the PEPÁḴEṈ HÁUTW̱ website and see a wonderful video Jakob Hjalmar Hólm, one of our geography alumni, created for the project.